It’s profound and so true. Urgency wrecks productivity. Urgent but unimportant tasks are major distractions. Last-minute distractions are not necessarily priorities. Sometimes important tasks stare you right in the face, but you neglect them and respond to urgent but unimportant things. You need to reverse that. It’s one the only ways to master your time. Your ability to distinguish urgent and important tasks has a lot to do with your success. Important tasks are things that contribute to your long-term mission, values, and goals. Separating these differences is simple enough to do once but doing so continually can be tough. Urgent tasks are tasks that have to be dealt with immediately. These are things like phone calls, tasks with impending deadlines, and situations where you have to respond quickly. Responding to an email, when you have to do it, is usually an urgent task. Important tasks are tasks that contribute to long-term missions and goals. These are things like that book you want to write, the presentation you’d like to make for a promotion, and the company you plan on starting. The problem is that important tasks usually get trumped by urgent tasks. Time is the raw material of productivity and creativity. Time, not money, is your most valuable asset. Invest your asset. There are 168 hours every week. Let that sink in for a moment. That is a monumental amount of time. Where could it possibly go? Or better still where are you spending all those hours? Ultra-productive people focus on getting a lot done with every minute they have at their disposal. Allocate time to each task you need to get done every day. And don’t get distracted by everything others expect you to do. Each task of the day should be attainable, realistic, and time-bound. And most importantly every task should advance your goals for the day, week or month. The time constraint will push you to focus and be more efficient. But here’s the thing: making good use of your time isn’t always easy. Preston Ni M.S.B.A. of Psychology Today recommends you separate obligatory time from discretionary time. 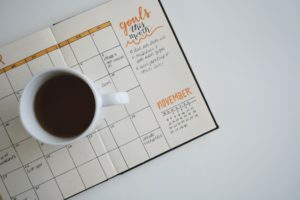 “In your day planner, block out all the times when you’re committed to others to be at a certain place at a certain time, such as meetings, conferences, and other appointments. What’s not your obligatory time is your discretionary time. This is the time you can manage.” says Preston. We’re subjected to thousands of distractions throughout the day. A study published in the Journal of Experimental Psychology found that you can be distracted simply by hearing or feeling your phone vibrate, even if you don’t pick it up. Try putting your phone out of sight (and touch) for 10 minutes of uninterrupted productivity. Modern technology has evolved to exploit our urgency addiction: email, Facebook, Twitter, WhatsApp, Instagram, and more will fight to distract you constantly. Turn off all your notifications. Choose to check these things when you have time to be distracted — say, during a break from work — and work through them together, saving time. It’s not easy but once you build the good habit of turning off notifications, you can actually get to work and be more productive. Schedule your priorities and stick to them. Treat your highest priorities like flights you have to catch: give them a set time in advance and say no to anything that would stop you making your flight. It pays to unplug. If you can be reached via smartphone, email, Twitter, Facebook or LinkedIn, you’re way too available and all these outlets are possible connections that can distract you from your purpose. Disconnect and watch as your productivity improve. Your smartphone might be the biggest productivity killer of all time. Most people just can’t put the phone away. If your phone is connected online, the temptation to stay updated about almost everything is very high. If you can, put down that phone (or power it off) for a while when in the office and witness the effect that can have on your level of productivity. It is easy to get excited with goals and try to take on too much but if you do, you’ll be spending your energy all over the place. The basic principle of success is to focus. It is what makes the difference between those who are successful and those who are not, regardless of how much talent, resource, and energy that they have. The most accomplished and well-known people in history were known for something unique to them. Einstein pursued the theory of relativity like his whole life depended on it. Relativity is one of the most famous scientific theories of the 20th century. Mozart was incredibly passionate about music. He was the very best for many generations before and after him. Even today, is there a second musician who could match his genius? Spend most of your time on the right things and the rest takes care of itself. It’s not enough to just ‘work hard’. Hard work is not necessarily a bad thing. But hard work can be a waste of your life when it’s thrown at the wrong things. Decide what is good for you in the long term and pursue it with all you’ve got. When you are doing too much at a time, you are constantly switching from one task to another, constantly interrupted, constantly distracted. Do less, clear away distractions, single-task, and get more done. When you do too much, your work is spread thinner, you have lower quality, and people won’t spread your work like they should. By doing less, you can create something remarkable. Something incredible worth sharing.